ScriptureDirect Interlinear Greek Bible App is easy to use on Smart phones and Tablets. It features a new interlinear English translation linked to the New Testament Greek text and NOT a published book in the form of an app. This makes it a super intuitive help for anyone reading the New Testament - with or without a knowledge of Greek. Each Greek word is linked to the modern and scholarly New Testament Greek-English Lexicon based on Semantic Domains, published by the United Bible Societies and edited by Johannes Louw and Eugene Nida. The main editor of this dictionary, Prof Johannes Louw, was also the main translator of the ScriptureDirect Interlinear Translation. He was assisted by Dr Bennie Wolvaardt, Founding President of Veritas College International who is also the developer and editor of this app. Tapping the English highlights the corresponding Greek and vice versa. You do not have to be able to read or pronounce Greek to access the Greek meanings that will show on the next screen shot.. Tapping either the English or Greek word for a second time provides all the possible meanings for the specific Greek word with the contextually correct meaning as selected by the translators, highlighted. All the Greek meanings for the New Testament are listed in 93 domains or groups of meanings as indicated by the numbering, providing an accurate and precise meaning analysis. Tapping the contextual or any other meaning opens a definition, translation words and examples where the same meaning of the word is used in the New Testament. Tapping the meaning again closes it. The meaning box is easily closed by touching the cross. The meanings and examples can be fully understood even without reading or pronouncing the Greek. All 27 books of the New Testament are included in ScriptureDirect. Bible books are chosen by sliding the names at the top and tapping a book. Each book is divided into sections, making it easier to find and read passages. Access font size and night mode settings by tapping the icon in the top right hand corner. 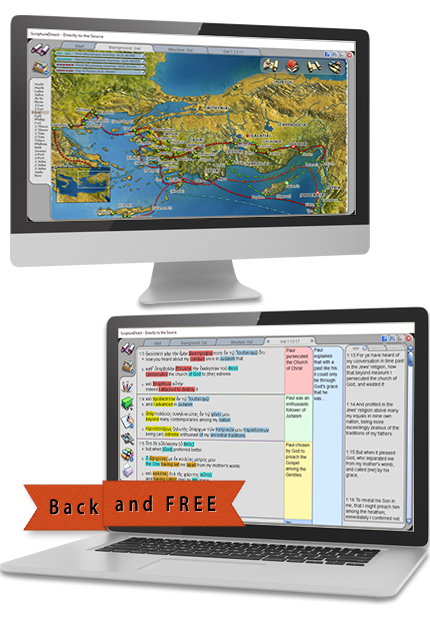 We are excited to announce that ScriptureDirect Interlinear Greek Bible for PC and Mac is back and now it is also free. The program for Windows PCs and Apple Mac is where it all started and it includes the same Unique Greek-English interlinear text found in the App. It also features creative tools for textual analysis and facilitates natural exegetical workflow. One of the standout features is the meaning sensitive search facility that finds words or phrases based on their meaning(s).